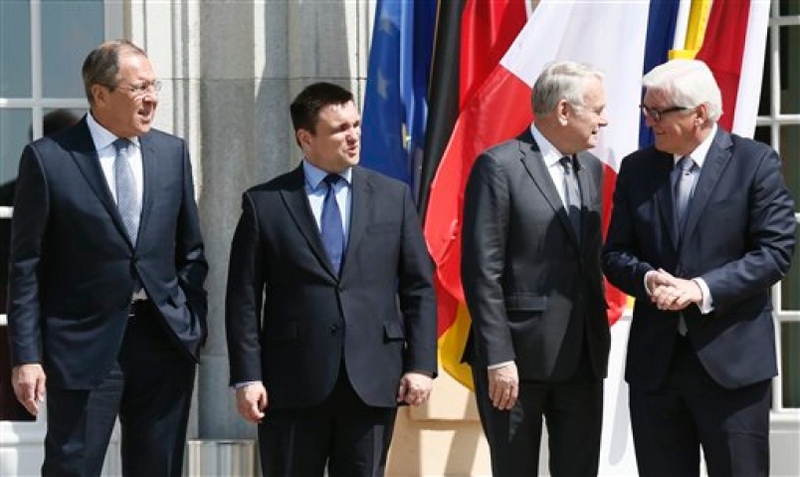 BERLIN (AP) — Talks between Germany, Russia, Ukraine and France produced several agreements aimed at improving security in eastern Ukraine but no deal on holding local elections in the separatist region controlled by Russia-backed rebels, a top German diplomat said Wednesday. Foreign Minister Frank-Walter Steinmeier, who hosted the talks at a lakeside retreat near Berlin, said the atmosphere was better than at their last meeting in Paris but acknowledged there had been no breakthrough. The parties also agreed to improve communications and to halt military training along the front lines to prevent any escalation of the conflict, he said, cautioning that the plans still have to be put into action. Steinmeier warned earlier that the 2015 Minsk peace accord for Ukraine would be undermined if there was no progress on its implementation, and that could escalate the conflict that has already killed more than 9,300 people in two years. Officials on Wednesday failed to agree on a proposal for how to stage local elections in eastern Ukraine, including whether those who fled the region would have a vote. “These are questions of detail that might appear small, but they are important for creating the basis for local elections in Ukraine,” Steinmeier said. “Security isn’t everything in eastern Ukraine, but there can’t be anything without security and so I’m quite satisfied with this part of the talks today,” he added. Ukrainian Foreign Minister Pavlo Klimkin said after the talks that security is the main priority but stressed that it is tied to the issue of elections. Russia has rebuffed a proposal for the Organization for Security and Cooperation in Europe to send an armed monitoring mission to the region for the elections. Russian Foreign Minister Sergey Lavrov said his country sees no need to deploy such a mission, though OSCE officials are welcome to observe the vote. Lavrov also insisted that Ukraine’s Parliament has yet to approve parts of the Minsk accord, including the passage of bills on holding elections in the east and an amnesty for the separatists. Germany is pressing for progress in Ukraine ahead of the scheduled expiration of European Union sanctions against Russia at the end of July. A decision on whether to prolong, modify or drop the sanctions — which were for Russian actions in Ukraine — will have to be made by EU leaders in six weeks.